Robert Ainsley Scott - Edmonton's Burial & Cremation Professionals | Trinity Funeral Home Ltd.
On August 28, 2016, Robert passed away at the age of 55. 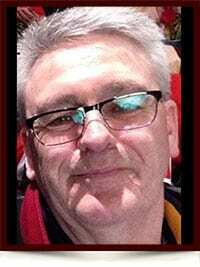 Robert will be lovingly missed by his mother May Scott, son Darcy, daughter Karoline (Kyle), sisters Heather (Steve) and Billie (Chuck), best friend John and numerous nieces and nephews. He was predeceased by his wife Dannette and father Bob. In respecting Robert’s wishes, cremation has taken place and he will be laid to rest beside his loving wife. A celebration of Robert’s life will be held in Fort McMurray at later date. In lieu of flowers, donations can be made to the Canadian Diabetes Association in Robert’s name. It Is with great sadness that we learn of Bob’s death. We wish to send our condolences and prayers to all his family. We both have known Bob for many years, Rest in peace our friend. May you all find comfort in each other and treasure your memories! God Bless!